We offer high quality, tailor-made skate parks in steel or concrete. We also have smaller portable steel skate ramps, easy to carry, designed for scooters, BMX and skateboards. The portable units can easily be integrated with one another to create bigger ramps that can easily be assembled and disassembled. Please contact us for more information about our Skate Park solutions. What can be nicer than playing barefoot on soft sand? We have the equipment needed for beach sports – everything from surfaces to goals, posts, umpire chairs, nets, line marking and balls. Please contact us for more information about our range of Beach Sport products. Disc Golf - or Frisbee Golf as it's also called - is a growing sport, especially in Europe. Disc Golf is easy to learn, but difficult to master. Disc Golf is a very social sport and can be enjoyed by everyone. 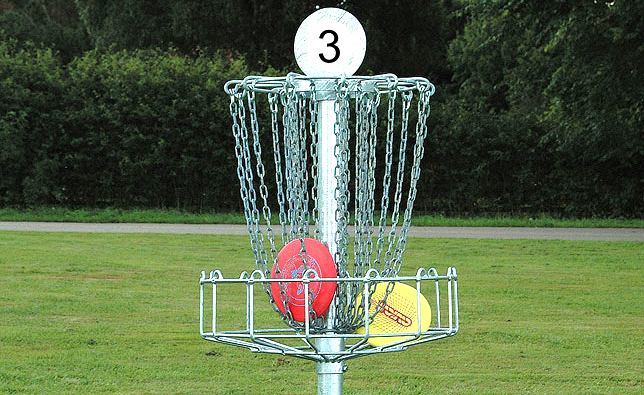 The setup is similar to traditional golf, however instead of clubs and balls, various sizes and weights of frisbees are aimed at a Disc Golf basket, the equivalent of a golf hole. The winner is the player that makes it through the whole course with the fewest throws. We will help you to plan a professional course with a professional design. The course has to be both varied and safe, whilst at the same time provide a positive experience for players of all skill levels. By investing in a disc golf course you create a long-term platform for sporting pleasure and recreational opportunities. Please contact us for advice, sketches, quotes or if you have any other questions regarding your next outdoor project.